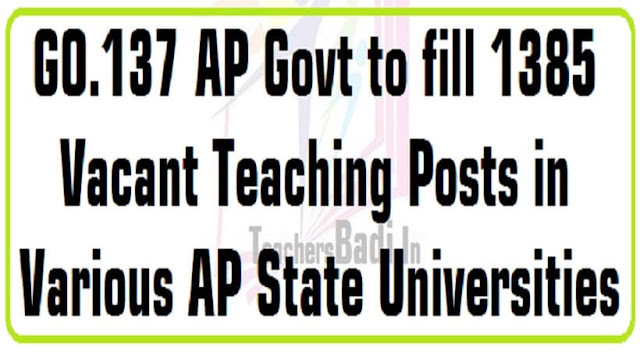 Report of the High Power Committee on Rationalisation of Teaching staff in Universities in Andhra Pradesh. GO. Ms. No. 56, Finance (SMPC.I) Department, Dated: 21.02.2009. GO. Ms. No. 57, Finance (SMPC.I) Department, Dated: 21.02.2009. GO. Ms. No. 59, Finance (SMPC.I Department, Dated: 21.02.2009. GO. Ms. No. 24, Finance (SMPC.I) Department, Dated: 28.02.2011. GO. Ms. No. 215, Finance (SMPC.I) Department, Dated: 23.09.2011. GO. Ms. No. 247, Finance (SMPC.I) Department, Dated: 05.11.2011. GO. Ms. No. 262, Finance (SMPC.I) Department, Dated: 30.09.2013. GO. Ms. No. 263, Finance (SMPC.I) Department, Dated: 30.09.2013. GO. Ms. No. 285, Finance (SMPC.I) Department, Dated: 11.10.2013. Higher Education Department U.O No 6521/UE/A1/15 Dt: 04.07.2016. ORDER: The Higher Education Department in the UO twelfth read above has informed that a five member High Power Committee was constituted for rationalization and to recommend to fill the posts of teachers in University Departments to overcome imbalances in demand and supply of teachers. The Department has stated that the High Power Committee has submitted it’s report and the Government has accepted the recommendations of the High Power Committee with certain changes. The Department has proposed and requested to issue necessary orders for filling up of 1385 teaching posts in various Universities in the State. After careful examination of the matter Government hereby accord permission for filling up of a total 1385 vacant teaching posts in Universities in two phases i.e., 1104 vacant posts in first phase in the academic year 2016-2017 and 281 vacant posts in second phase during the academic year 2017-2018 as per the recommendations of the High Power Committee as details shown below. The permission now accorded for recruitment to various teaching posts includes the vacant posts for which permission was already accorded in references third to eleventh read above and the recruitment process is at different stages. The University-wise distribution of teaching posts for filling up in first phase and second phase is given in Annexure-I and Annexure-II respectively appended to this order. As per the recommendations of the High Power Committee the Government hereby issue orders for conversion / down-gradation of 576 posts of Professor / Associate Professor / Physical Director etc., as Associate Professor/Assistant Professor / Assistant P.D. as the case may be as details shown in annexure-III appended to this order. Higher Education (UE) Department shall issue necessary guidelines duly ensuring fair and transparent method of recruitment to the above teaching posts viz, recruitment method, recruiting agency, roster points, ROR etc. (BY ORDER AND IN THE NAME OF THE GOVERNOR OF ANDHRA PRADESH) AJEYA KALLAM SPECIAL CHIEF SECRETARY TO GOVERNMENT To The Higher Education (UE) Department. Copy to: The Secretary, A.P State Council of Higher Education, Hyderabad Registrars of all Universities in the State P.S to The Joint Secretary to Hon’ble Chief Minister P.S to Hon’ble Minister (HRD) P.S to The Chief Secretary to Government The Special Chief Secretary to Government, Finance Department //FORWARDED :: BY ORDER// SECTION OFFICER G.O. Ms. No. Date: 27.07.2016 Annexure - I Table showing University-wise and category-wise distribution of teaching posts for filling up in first phase in 2016-2017. SECTION OFFICER G.O. Ms. No. Date: 27.07.2016 Annexure - II Table showing University-wise and category-wise distribution of teaching posts for filling up in second phase in 2017-2018.